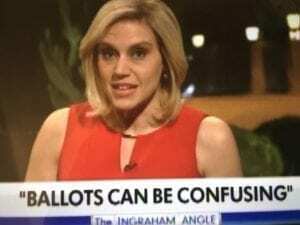 Ballots are only confusing if disrupters tell you they are. It’s disappointing that having a few adult use retail marijuana stores in Newton has fostered such anger in those opposed to having them here. It’s gone well passed a respectful disagreement. It’s difficult to understand why their anger is so impassioned. It can’t just be about these few stores locating in Newton, there has to be a deeper, underlying reason because these stores will be located in communities all around Newton. In these times when misdirection and lies grab the media’s and decent folks attention, it’s hard to get through all of the loud distractions to get the truth to voters. Marijuana has been legal since 2016 – made so by voters not just passed by the legislature. These voters knew there would have to be ways to distribute it – thus retail stores would be needed. Marijuana is legal in all of MA. Having them in Newton will change only one thing – added revenue to Newton. OON is using standard fear tactics found now in national elections. Using cartoons to attract attention. Having a fit over a man in Wellesley just because he is wealthy -just like their own spokespeople. Using slogans to confuse voters instead of enlightening them – even using slogans to put lies on their lawn signs – “sham” 2-4 question. 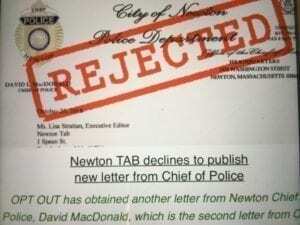 Putting in the Patch, a letter with no factual basis and totally irrelevant to retail stores in Newton written by the chief of police that the Tab wouldn’t publish. It contained opinions he heard at a conference in Washington State that pertained only to Washington State. Deflecting factual statements such as the zones and areas established to locate these stores by interjecting them with biased “clarifications,“ leaving out the half mile circle where no shops are allowed around any location. Tomorrow we vote. Either to allow marijuana stores in Newton or to ban them. Do you think this fear mongering, attempts at confusion and distractions are working on voters to get them to vote yes to the ban? Do you think the simple message that when locating marijuana stores in Newton, the only change will be the revenue Newton gains is getting through to voters to vote no on the ban? I’m surprised that V14 is finally publishing some of Opt Out’s best arguments instead of the usual pro- cannabis stuff! 1. 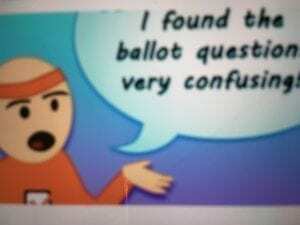 Do I find having two conflicting ballot questions confusing? YES! 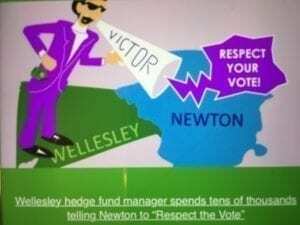 2 Does it concern me that a Wellesley hedge fund manager is financing opposition to a ban so he can open a pot shop in Newton? YES! 3. Do I think it’s a sham to put a so-called “limit” on the ballot when the City Council can change it at any time through zoning? YES! 4. Most importantly am I concerned that people belittle what our chief of police says when he is in charge of making us one of the safest cities in America? YES! Sara-You’ve once again shown disrespect to the opinions of those who disagree with you. The use of the word “sham” to describe a political opinion has crossed a boundary that’s never been crossed before in Newton. Marti made some great points about tactics that the official campaign used. As we’ve discussed before, some supporters go too far, but this one aspect of the official OON campaign in my opinion went too far. If the city council hears from a number of residents that they don’t mind a few shops, but want them placed away from village centers, not near schools and several councilors propose an alternative that accommodates reasonable requests, what is wrong with that? The majority of councilors voted in favor of the option on two different occasions. Are all those councilors deceptive as well? Or were they merely hearing from other people with different opinions? It seems to me they were doing their job-listening to a wide variety of opinions on a tough issue and trying to come up with a solution that addresses as many concerns as possible. @Sara – If you think that 2-4 is a sham, then a ban is equally a sham – neither decision will be binding to the city council. HOWEVER, IF we want to limit the number of stores outlined in the law from 2016 we have to have a plebiscite about it, so where is the sham? If you paid attention as to why these two question need to be separate – as opposed to stacked – you’d know that our city rules require it to be so. Otherwise, where is the confusion? They are written pretty clearly. I am not belittling the chief of police – I am just saying that he is arguing legalization. Obviously he would still prefer that it were outlawed. But that decision was made almost two years ago and it will not make one iota of a difference if we have stores here or not – there are and will be people who are irresponsible users of cannabis (just like with alcohol and prescription drugs) and we will have to try to keep them off our streets (via outreach programs) or develop better ways to catch them before they do harm (via financing new ways to find them). Neither can be done without tax money. At least the cannabis money (as opposed to alcohol and prescription drugs) will carry a tax (11.75%) that is put in a fund for just that purpose and more. Opt Out Newton’s narrative is as a community champion fighting off Big Weed’s corporatist agenda. RFSN’s existence as a community grass-roots movement contradicts that narrative, and we’ve been squabbling ever since. In a different world OON could have tolerated compromise (e.g. ‘we recommend no but vote your conscience’) and win or lose, would have guaranteed to take down the 8-store requirement. Now — well I’m not sure anyone knows just what will happen tomorrow. We will all see. At the Mayor’s behest, the city Council stacked the deck in favor of their preferred option which is the 2 to 4 store limit. They knew that the people who wanted a few stores would vote for that and also that many of the ban supporters would also vote for that as a back up in case the ban fails, inflating the numbers for the limit. The only way for opt out to win is to encourage people who want the ban to vote against 2 to 4. I thought the mayor wanted three questions on the ballot and the council rejected one – it related to the 8 store option. The 2 to 4 option was already on the ballot. I think you’re making my point – there are people who want just a few stores and let the councilors know that. Not quite getting what’s wrong with that. If that’s what a constituent wants, wouldn’t you expect that opinion to be shared with the city council? It’s what I advocated for. The referendum legalizing the use and sale of marijuana passed in 2016 and it was time to move on. At the same time, the city is built out and I don’t see locations for more than four shops. I don’t know that a suggestion of bias and/or collusion by our city government in favor of 2-4 is correct. In June, the City Council denied OON’s initial petition but approved limits to get onto the ballot. As a longtime follower of City Hall politics, there were specific procedural reasons why the evening unfolded the way it did. In September, after OON collected 7,000+ signatures City Council came very close to knocking limits off the ballot thanks to heavy lobbying from OON. Again, the evening unfolded step by procedural step. The mayor did request City Council to have 3 questions – I don’t know the rationale for that, but City Council did not bite. I wish OON had run a campaign exactly as you describe (“encourage people who want the ban to vote against 2-4”). That’s not the campaign that OON chose to run. I chuckle every time I see the signs with the word sham on it – for the same reason Patricia said. If 2 to 4 is a sham, then so is the ban. I was horrified seeing these signs today. it’s one thing to have a different opinion another to call someones view a “Sham”! One thing everyone needs to think about. How many thousands of people don’t get a medical license because they don’t want their name in a registry for a variety of reasons including their job. they live with pain everyday. ONN has stated many times they don’t have a problem with medical MJ. If recreational is voted for many thousands of people will now get relief as the MJ will be the same as medical and not to have to register. Let’s think of humanity here too. There was nothing stopping the city council from writing their 2-4 question to be explicitly conditioned on (and deferring to) the opt-out question. The rule you describe is for when competing proposals go on ballot from competing groups. The majority of the city council appears to be against opt out (or they could have put the question on themselves on themselves in August) and at least some saw making 2-4 conditional on opt-out as giving up the opportunity for it to get a larger majority. The downside to that is that now may not get an authorizing majority, and the city gets 8 shops. This is a fine outcome for many, but some have valid concerns about locating those 4 additional stores. Marti made this comment in an earlier thread that I didn’t understand discussing early voting: “The bad news – they ask if you want the municipal ballot after handing you the state ballot.” Is it bad for people to vote on this? Yes if you want to opt out, no if you don’t. If you live next to a med dispensary location, and want either a ban OR no limit, vote no. (clear choice not dependent on guesses or strategy). If you want to ban or at least limit, and think opt out will not get majority, vote yes. If you want to ban or at least limit, and think opt out will get majority, but risks winning by smaller majority than 2-4, vote no. If you don’t want to ban or limit, and think opt out will get a majority, vote yes to get a bigger majority to override ban. If you don’t want to ban or limit, and don’t think opt out will get majority, vote no. If you don’t want to vote opposite your primary intention, blank in protest? I have likely missed a few scenarios. I am going with Tedd Hess Mahon on this. I want it legal, taxed and regulated. This is not a new issue, teen drug use. The Newton School Committee has been working on this since 1972. April 13, 1972 to be exact. The issue was students using open campus to drive to Waltham, Lexington and surrounding communities to sell drugs. Among other things. When I campaign, I try to stick to the issues and keep my personal life out of the it. But it was really hard for me to hear that OON claim that they cared about keeping kids safe. Not one of them acknowledged that the chair of RFSN is a Newton public school teacher of 30 years, another was a school committee member and chair for eight years, a third ran for school committee because he felt a strong commitment to the system, a fourth has been one of the most involved parents at all levels in more ways than I can count, another grew up in another culture and was able to share first hand experience in how to teach children about substance use and abuse, and another has spent the better part of the last 10 years making trips to and from schools safe and walkable. RFSN cares about kids and have demonstrated it in many capacities. Keeping kids safe emotionally and physically is a top priority for everyone in this city so please , let’s take that off the table. Jack – People vote as they see fit for whatever reasons they want. It’s as simple as that. Jack, I meant the bad news is that both ballots were not just explained and handed to voters. I think voters should be given both ballots and not just asked if they want the municipal too. I would have happily explained what I meant if I knew I was being confusing. Next time please just ask. @Marti — thanks for explaining. That makes sense. Good news seems to be that most everyone is taking a city ballot. The bigger concern would be if you needed to go to a different table proactively (as is the case with area council elections). @Jane — “as they see fit”. You have a lot of experience interacting with a wide range of voters. You propose the full ~33K that may vote on this get the nuances? For example, if you prefer opt-out, then 2-4, then 8, and you think opt-out and 2-4 are ahead of 8, then vote no on 2-4. On the other hand, if you think opt-out will not win (ranked 2nd or 3rd), then vote Yes. That works out to 36 combinations of preferences and expectations. Very simple. Alternatively, if 2-4 was conditional on opt-out, you’d vote up or down on your 2-4 preference. Complex and unfair. I think 2-4 should be criticized for its confusion and unintended vote consequences, not the possibility it will be expanded beyond 4. RSFN is transparent in its naming that 2-4 is a start. Here is a more simplified table looking at it in a different way. What are your ranked preferences and what two outcomes do you think are in contention to win. In the scenarios where you think 2-4 is totally out of contention to win, and it wasn’t your first choice preference, then it doesn’t matter how you vote on it as it doesn’t spoil opt-out vs. 8 either way in that case. Jack -A significant number of Newton voters contact a person whom they know and ask for a list of people/positions to vote in a municipal election. That is how they see fit. I can’t make head nor tails of all of your commutations. The easiest explanation is for voters to read the two questions and decide whether to vote yes or no. OON has made a significant effort to make a simple process “confusing”. It’s been a campaign tactic since day 1. That’s all it is. You’re just pulling the same campaign tactic for the same reason. The questions are written in simple language. The only complaint I have is that there’s way too much text on both the municipal and state ballots before you get to the actual question. You know what would make Newton safer? For people who send little lie- and fear-filled postcards weren’t in our community. What would make it even safer would be to ban the sale or consumption of alcohol in Newton. But, I’m sure the Opt Out Newton organization thinks drinking is ok and does not impact the safety of Newton and its residents. Especially if they like to drink. Then they’re never going to say there’s a problem with all the alcohol shops, superstores, and locations where alcohol may be consumed on premises. @Jane — I’m not a supporter or endorser on either side of this, but think people should have been able to weigh in on this clearly for better or worse (democracy and all). If 35000 to 1 vote to absolutely opt out and then 35001-0 vote a preference for 2-4 OVER 8 (not over opt-out), the city gets 2-4. Newton has smart voters, but only a couple of 1000 following the inside baseball (no charter schools!). The RSFN website closes the campaign still lacking any rationale for voting for 2-4 over 8. https://www.nobannewton.org Even a simple “2-4 needs to get more votes to ensure it overrides a possible opt-out majority” would have been sufficient transparency on this point. OON could have also been more transparent focusing on this issue as the driver for No on 2-4 rather than focusing on city council possibly raising limit in the future (which RSFN is transparent about right in its name). I still think the “pro” drivers on this are (1) further destigmatization and availability of cannibis for medical use and (2) undermining illegal supply chain and its associated gateway and quality risks. There are more important that the financial rationale and the “respect the vote” focused on.